Acer is one of the leading laptop manufacturers in Europe and targets consumers with its comprehensive Aspire range. Combining impressive components, performance, mobility and usability, the Aspire 5735-584G25Mn provides fantastic value for money. Despite having a fairly heavy chassis, its 2.7kg weight is no heavier than its rivals at this price. The glossy black lid and matt gun-metal plastics give it a solid corporate appearance, and build quality is indeed excellent. The 211-minute battery life also provides strong mobility. A key feature of this laptop is its 15.6-inch widescreen panel. Its 16:9 aspect ratio is slimmer and wider than some others, so suits widescreen movies and viewing multiple windows. Brightness is excellent, as are the screen's colour and contrast. The widescreen also allows room for an equally spacious keyboard. The full-sized keys make it highly accessible when speed-typing and all the keys move with a smooth and quiet motion. A full pad of numerical keys is also included. Beneath the keyboard is a large 84mm wide touchpad. Its design perfectly matches the widescreen panel, so makes it easy to navigate onscreen. It is also multi-gesture compatible, allowing you to zoom into images and scroll documents with a pinch or twirl of your ﬁngers. 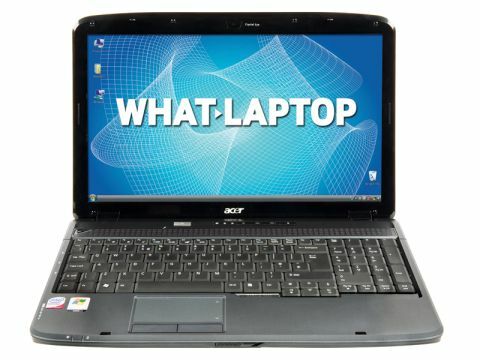 Most laptops at this price point use basic entry-level components, but the Acer's Intel Core 2 Duo processor and 4096MB of memory are far more suited to running high-performance software. As a result, this is a surprisingly powerful laptop that is ideal for multi-tasking. Graphics performance is also strong and betters all but the HP Compaq Presario CQ60-313SA. Basic games can be played and there's ample power for home photo and video editing. HD videos also play smoothly enough. The 250GB hard drive provides comprehensive storage space for such a low price point. The dual-layer DVD rewriter lets you write data to CDs and DVDs, including DVD-RAM, and the 5-in-1 memory card reader supports the leading ﬂash card formats. First-time buyers will appreciate the inclusion of Microsoft Works software, as it provides basic home ofﬁce tools. Additional tools for viewing DVDs, creating your own discs and securing your laptop for internet use are all also included, adding to the overall value. With such a strong combination of performance, usability and value for money, there's almost nothing to ﬁnd fault with the Aspire 5735-584G25Mn. Even at a higher price it would be a great bargain, so at such a low and affordable price as this, it's even easier to recommend.